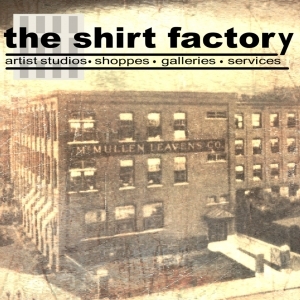 More than 50 artists and 13 retail shops are housed in the former McMullen-Leavens Shirt Factory. Shop, take a class, see artists at work, visit galleries, learn about local history and more at the Shirt Factory Arts and Healing Center in Glens Falls, NY. Owner Eric Unkauf purchased the building in 1999 thinking to use it for a machine shop. He decided instead to divide it into rentable spaces. Artists flooded the building, loving it for its unique look, incredible windows and light. These tenants form the colorful community of artists and merchants of The Shirt Factory Arts and Healing Center as it is known today.